By Martin Mowforth (Photo credits: Blue Ocean Network and Activist Angler). Lion fish (Pterois volitans) are native to the Indo-Pacific, but are now established along the southeast coast of the U.S., the Caribbean, and in parts of the Gulf of Mexico. It is thought that their ‘invasion’ of these areas of sea over the last 25 years may have been due to humans dumping them at sea from their personal aquaria, although earlier reports that they escaped from one large, breached aquarium after Hurricane Andrew in 1992 are now thought to have been mistaken. They present a problem to many native fish as they are able to eat anything at least half of their own size on account of their extremely wide mouth and expandable stomach. In 2016 the Environmental Network for Central America (ENCA) supported a programme of protection for young lobsters on whose growth many families of the indigenous Guna Indians depend (for both nutrition and finance) in and around the San Blas Islands off the Caribbean coast of Panamá. Through the local Centre for Environmental and Human Development (CENDAH), the Guna fishermen and lobster catchers devised a system of ‘casitas cubanas’ under which the young and adolescent lobsters could hide during the day when they would be vulnerable to prey by the lion fish. A report of the programme was given in ENCA 68 (November 2016). 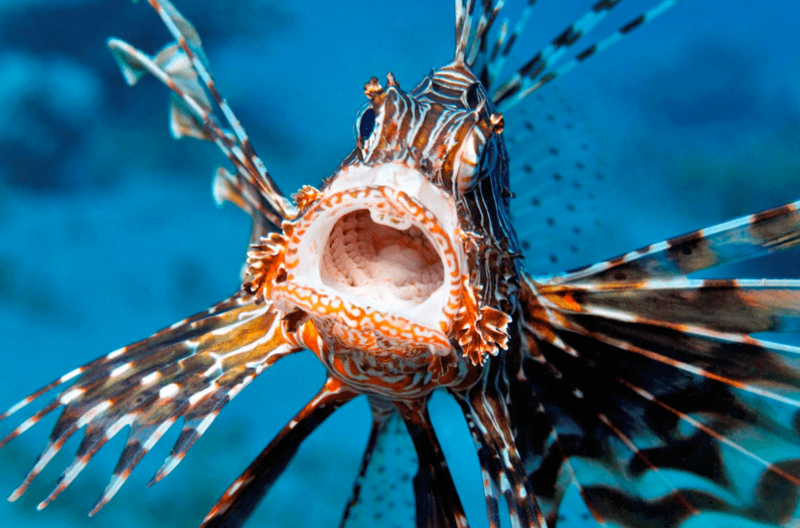 Lion fish have few predators and they eat small crustaceans and fish, including the young of commercially valuable fish and, as the Guna have discovered, young and adolescent lobsters. Their potential danger is not restricted to fish species, but also relates to the health of the coral because they eat what are known as ‘grazers’ and ‘cleaners’ of the coral which eat the algae that grows over the reef. The presence of the grazers and cleaners keeps the algal levels low and allows the corals to get enough oxygen to survive and to spawn. A paper by Cobián-Rojas and Schmitter-Soto (2018 in the International Journal of Tropical Biology) reports on the results of research with the title given above. The two protected marine areas in which the study was carried out were the Guanahacabibes National Park (Cuba) and the Xcalak Coral Reefs (Quintana Roo, Mexico); and the study carried out visual censuses of fish species in coral reef habitats during both dry and rainy seasons in 2013 to 2015. In general, the results showed a greater wealth of species in the Cuban protected area than in the Mexican area. 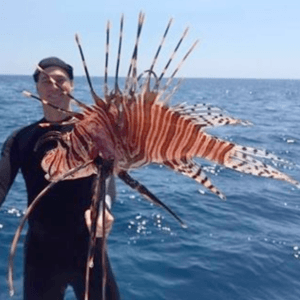 The species diversity was shown to decrease in only one census site in Cuba and in two sites in the Mexican area, although it is posited that this may have been due to fishing activity rather than to the lion fish. It was further posited that the effects of the lion fish on species diversity may not yet be detected.